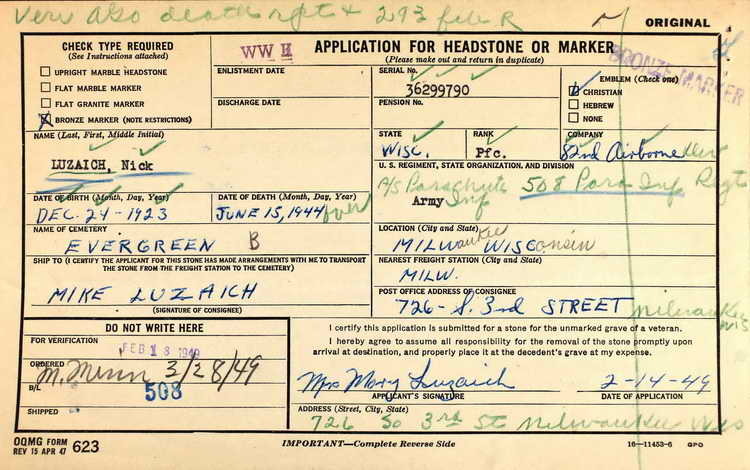 Grave marker application for Pfc Nick Luzaich in the former Evergreen Cemetery, now known as Glen Oaks Cemetery, Milwaukee (Milwaukee county), Wisconsin. Nick enlisted in the Army at Milwaukee, WI on 21 January 1943 and went through basic training and jump school before joining the 508th PIR. On 27 October 1943 he was assigned to Company A while the regiment was still posted to Camp Mackall, NC. Pfc Luzaich was killed in action on 14June 1944, although some reports indicate 15 June, and was awarded the Combat Infantryman Badge and Purple Heart, both posthumously.